Sacramento Republic FC wrapped up Operation Turnkey on Tuesday, taking critical steps forward in their efforts to bring Major League Soccer to the region. On Tuesday, the club not only unveiled new architectural renderings for their new home at The Railyards, but also captured a unanimous City Council vote in favor of a preliminary term sheet guiding the construction of the stadium. The meeting was a symbolic if not literal demonstration of the partnership between Republic FC and the Sacramento region and community. With the council room packed with Republic FC fans, there was no question of the fan and community support for the term sheet. After the unanimous vote in favor of the term sheet, Republic FC fans didn’t just stand and applaud; they enthusiastically broke into song and took a photo with City Council members to mark the occasion. “The fans are here. The crowds are here. 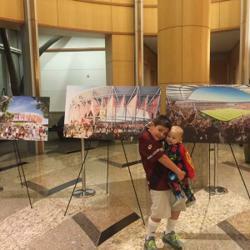 We’re a soccer city to the max,” said fan Jake Monka, one of the many fans attending the Council meeting to show their support for the project. For many, the term sheet was a reflection of Republic FC’s ability to use the beautiful game to bring the community together; something Smith stressed as the vision of the club from the beginning. When Council Member Allen Warren asked if there were any opponents of the proposal in the room, no one stood. Ashby went on to emphasize The Railyards represents the next phase in developing Sacramento’s urban core to grow the city’s arts, sports and entertainment venues. During the City Council meeting, councilmembers and fans alike expressed universal support for the term sheet that outlines details of the privately funded stadium. The term sheet does not ask for the city to provide any public subsidy to the budget, but city staff will help Republic FC throughout the development process. The term sheet further specifics how the city will oversee the development process, with Republic FC covering the costs of predevelopment, design, construction, budget overruns, security and other associated project costs. The widespread support for the project shown by both the community, city and club alike comes from the plan a privately-funded stadium will not only be a catalyst for development in The Railyards—which has set empty for nearly a century—but also serve as a gathering place for a variety of events. In addition to soccer, the stadium will host concerts, festivals, other sporting events and at least four city events each year. Republic FC’s stadium will serve as the anchor and catalyst for The Railyards development, which is a crucial element of an envisioned Innovation District in downtown Sacramento. Alongside the Sacramento Kings’ new arena, The Railyards project is part of an unprecedented amount of economic activity, investment and interest in Sacramento’s downtown urban core. Even more though than estimated $341 million in economic output and 2,628 jobs the stadium will bring, for many community members and fans, the stadium project represents more than just development opportunities. “I wore my scarf tonight because I know Sac Republic believes in our community,” said Council Member Steve Hansen, who sported a Republic FC scarf designed by Sacramento artist David Garibaldi. “It’s in our existence and the whole DNA of Sacramento Republic FC is to make the Sacramento region the most inspiring, energetic and rewarding place to live, work and play,” said Smith. Fans may make a $50 refundable deposit to secure priority seating for the new MLS stadium here.